Those from Liverpool are called Liverpudlians. 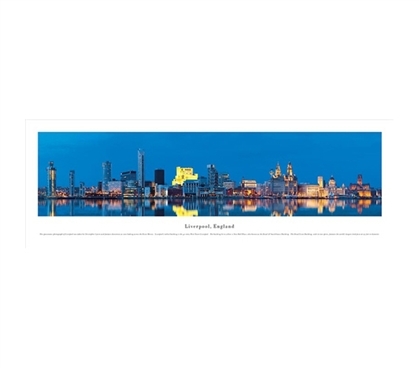 If you're not from Liverpool, though, that's OK. You can still hang this Liverpool - England - Panorama as part of your college decorations. This panorama for college dorms is a great dorm room decoration, as it can bring some English flair to your college decor. College shopping includes buying plenty of items for college, including dorm room decorations. So give your dorm a unique look by adding something more than just dorm posters. Branch out with your college wall decor! This panoramic photograph of Liverpool was taken by Christopher Gjevre and features downtown as seen looking across the River Mersey. Liverpool's tallest building is the 40-story West Tower-Liverpool. The building lit in yellow is New Hall Place, also known as the Royal & SunAlliance Building. The Royal Liver Building, with its two spires, features the world's largest clock faces at 25 feet in diameter. Liverpool Cathedral is lit to the far right. Beginning in 1715 with the building of its first dock, this port city became one of the wealthiest cities in the world through maritime trade. Much of the architecture reflects this period of prosperity.